Once, long ago, I thought Wineck-Schlossberg was a second-tier vinyard which at best gave crisp, fresh, but one-dimensional wines from its hard granite. Fish wines, in short. But Frédérick Bernhard has used his his wand to prove how wrong that assumption was. For each vintage his wines gain more and more of the substance, complexity and real terroir character. 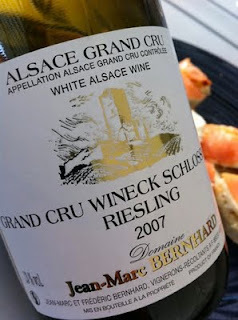 2007 Riesling Grand Grand Cru Wineck-Schlossberg by Jean-Marc Bernhard in Katzenthal is yellow with a green stick. The nose is initially closed, but after an hour, wonderful aromas of apple, melon, pineapple and chalk burst out of the glass. The taste is medium bodied with excellent focus, high, vibrant acids and a complex and dense palate with grapefrukt in the long finish. Darn good. Price: € 12.